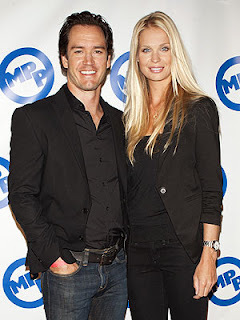 XOXO Jes - Canadian Entertainment News: Mark-Paul Gosselaar Engaged yet again! Mark-Paul Gosselaar Engaged yet again! Oh MPG...you can't just stay available for even half a year! Mark-Paul Gosselaar finally got divorced in May of this year and is now engaged to an advertising executive who kind of looks like a younger Nicolett Sheridan with less work done. My childhood bestie is going to be absolutely devastated when she finds out that Mark is off the market yet again. I am pretty sure she is still cleaning up from her "MPG is Divorced!" party. This is my second Zack Morris post today. So random.